A British Airways flight from London City Airport that should have gone to Dusseldorf in Germany on Monday morning landed in Edinburgh by mistake. The flight paperwork had been submitted incorrectly, the BBC reports. The passengers only realised the error when the plane landed and the pilot declared “welcome to Edinburgh”. A passenger later explained that initially people on board thought this was a joke, but on realising the mistake the pilot asked the passengers to raise their hands if they wanted to go to Dusseldorf. Everyone raised their hands. There was a wait on the tarmac of almost three hours before the plane started up again and took off for the correct destination. The flight took off from London at 07:30 and had been supposed to arrive in Dusseldorf at 09:40 local time. Instead it reached the German city at around 13:00. 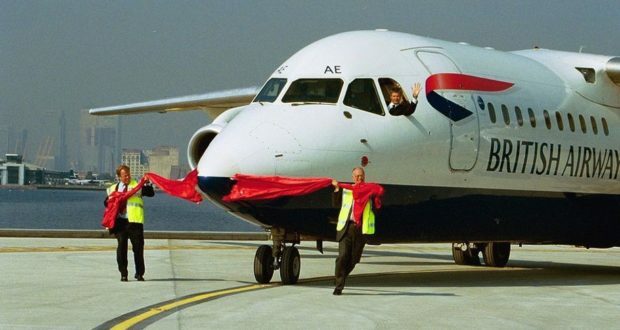 It was a British Airways CityFlyer service, CityFlyer being a wholly owned BA subsidiary that mainly operates UK domestic and European services from its bases at London City and Edinburgh. However, the flight was operated on behalf of CityFlyer by Cologne-based charter carrier WDL Aviation as part of a wet lease. BA says the pilot did not get lost. The mistake happened simply because the paperwork said Edinburgh, so the flight headed there. “We are working with WDL Aviation, who operated this flight on behalf of British Airways, to establish why the incorrect flight plan was filed. We have apologised to customers for this interruption to their journey and will be contacting them all individually,” BA said in a statement. WDL says it is “working closely with the authorities to investigate how the obviously unfortunate mix-up of flight schedules could occur”.